The “Kadenang Ginto” star also shared the struggles she and art curator Norman Crisologo had to face early on in their relationship due to their huge age gap. If there’s one thing to admire about Beauty Gonzalez and her husband, art curator Norman Crisologo, besides crossing boundaries with their marriage, it’s their ability to laugh about their past struggles as the unconventional couple. “I had to kiss a lot of frogs before I got my king. Not a prince. 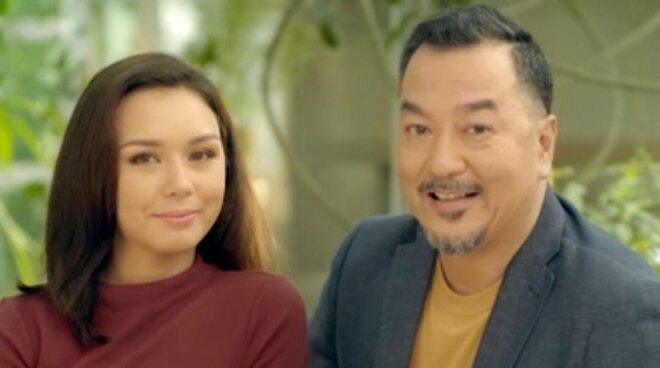 I wanted a king,” quipped the “Kadenang Ginto” star, as seen in a promotional video for a local toothpaste brand recently. After having spotted Beauty in a “really hot” magazine cover, Norman scoured his contacts in showbiz just so he could obtain her contact number. He then asked her out for a date – with the actress initially mistaking her for a condominium salesman – and the rest is history. “Maraming na-shock. Bakit daw masyadong malaki yung agwat namin. ‘He’s too old for me’,” said Beauty of the reactions they got over their once-controversial 15-year age gap. Once, Norman was even mistaken for being Beauty’s father – something that the pair like to look back in laughter. “One time we went to this camera shop in Makati. And then we were looking at this camera, and then the salesman was trying to sell it to us, so he was giving us a demo. So he was saying, ‘Oh ganito ho ma’am, ganito, ganyan. Eto. Teka, picture-an natin si daddy. Oh, daddy! Daddy! Smile, daddy!’ They were looking at me, so smile naman ako, syempre wala akong magawa. But, you know, we just had a good laugh,” shared Norman, who, like his wife, is by now used to such reception. For the Crisologos, at the end of the day, what matters is that they stay true to their love. “We were just open about it. And siguro if we hid, tinatago natin, If we acted guilty then maybe it was an issue for everyone. ‘Pag guilty ka talaga lagot ka eh." “But syempre haters are haters. And there’s always gonna be someone who makes comments,” concluded Norman.